From Truck Yeah: Two weeks ago we saw the first picture of Sad Ben Affleck Batman standing next to his fancy new Batmobile. 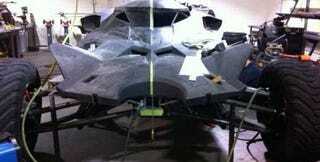 Since then, a new photo has surfaced that purportedly shows the car from 2016's Batman v. Superman: Dawn Of Justice. And it looks like a gigantic Rally Fighter!